My take on it is that the name has been removed as a symbol of the arcanum itself. The ego revolves around one’s name. Who are you? I am so and so, is the common answer. We most definitely are not our names or the ego or the body associated with that name, yet we have become used to such notion to the degree that we will take extreme measures to protect our names and the enormous emotional charge that is associated with the “me” behind the name. If this arcanum represents the need to eliminate that which is useless, spiritually speaking, then the symbol of not having a name points at the elimination of one’s primary image of self. Remove the image and what is left apparent is the Real Self. Death’s scythe is exactly where the name would be. What a powerful symbol. As for the general concept of this arcanum, the idea of Death is very accurate for what it represents. It is the elimination of the unimportant, of the useless and of the harmful from our personalities and psychic field. So, if the process shown by the arcanum is performed accurately and fully, it is literally the death of those useless things. And only with the death of those things can Temperance show up. So, I have no problem calling this arcanum: Death. Can the dead stuff rise again? Maybe, maybe not. That is the Devil’s business; it is another archetype. 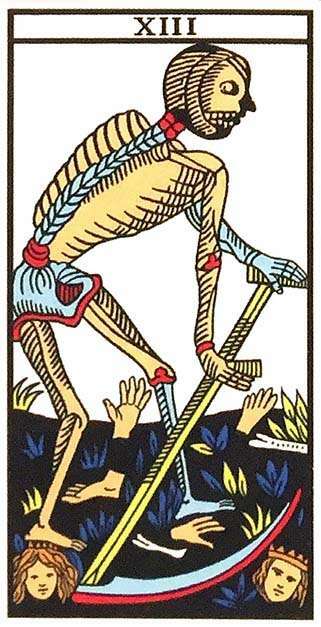 With Death the stuff that is cut off is dead for the time being and fulfills the purpose of opening psychic space for Temperance and the following arcana representing facets and dimensions of the spiritual path.